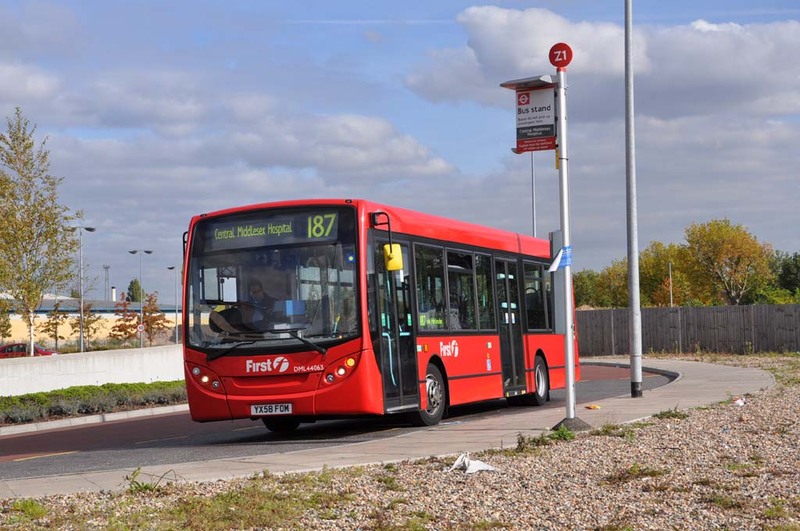 First Centrewest has re-equipped nearly all its Dart routes at Willesden Junction garage over the last couple of years as contracts have been renewed, with the sizeable allocation of Marshall bodied Dart SLFs being replaced by new Enviro200Darts. Even though earlier Dart SLF variants had different class codes and the Enviro200Dart incorporates substantial engineering changes, they have the same class codes as the Marshall Darts, differentiated only by length. Again, two photos are provided, both taken at the Central Middlesex Hospital terminus on Sunday 18 October 2009. First off is DML44063 (YX58 FOM). The previous abbreviated display of Cent Middlesex Hosp is now spelt out in full, meaning that a squashed font has to be used. Use of abbreviations on destination displays is contrary to TfL policy. The second photo is of sister DML44050 (YX58 FPJ). Having rotated the camera view, one would hardly imagine this dump is the same location! The first photo is not quite immaculate, but gone are the modern buildings, landscaped embankment and freshly planted trees, and in come the dilapidated 1960s buildings and scruffy billboards. The 187 started on 20 November 1940, during the Second World War, which in retrospect seems to have been a strange time to have introduced a new route. But it was one of a number of "railway relief" routes introduced around that time, designed to assist the railways which were badly affected during the Blitz. The initial routeing was from South Harrow via Northolt Park, Whitton Avenue West and East, Alperton, Hanger Lane, Ealing Common, Gunnersbury Lane, Gunnersbury Avenue, Turnham Green to Hammersmith (Brook Green). Much of the route was completely new, although the section around Gunnersbury Avenue covered route 70 at times when it did not operate. (The 70, Kew Green to Hampstead, was a double decking of route 231 over the same routeing, but with reduced hours of operation at the western end). However, the Sunday service was withdrawn from 19/03/41. However, the Gunnersbury Avenue section cannot have been too busy, as in the major changes of 29/10/41 the 187 was curtailed at Hanger Lane and diverted via Western Avenue, North Acton, Chase Road and Harlesden Station to Harlesden. The section between North Acton and Harlesden duplicated another section of route 70. From 14/01/42 the 70 was withdrawn (the Kew Green end by now covered by the 7), and the 187 extended over the northern end of the 70 to Hampstead Heath via Kensal Rise, West Kilburn (as Queens Park was then known), Warwick Avenue, Hall Road, Ordnance Hill, Maida Vale, Swiss Cottage and England’s Lane. There was no evening service between Alperton and Harlesden, owing to blackout restrictions. After such a turbulent start, the route settled down for some time. However, the 1966 fashion for introducing -A and -B suffixed variations of routes duly struck and in 1966 the 187A appeared, operating on Mondays to Fridays only between Hampstead Heath and North Acton, with a very strange rush hour extension to Brent (Cross) Station via the North Circular Road. Since the 187A covered the Hampstead Heath end of the 187, the latter was curtailed at West Kilburn during the week, still running to Hampstead Heath when the 187A did not run at weekends. Later, most of the 187A service was cut back to Willesden Junction, but with midday journeys running as far as Park Royal Station (and the rush hours journeys to Brent Station remaining), while the 187 was withdrawn between South Harrow and Harlesden on Sundays without cover. The 187A was withdrawn again in 1970, and the 187 returned to Hampstead Heath on Mondays to Fridays. The route also lost its Sunday service completely. One person operated buses were introduced in September 1982, at which time the route was also withdrawn between West Kilburn and Hampstead, partially replaced by an extension of route 46. The route was diverted via Park Royal ASDA and the Central Middlesex Hospital from 24/11/84. Buses still served the south end of Chase Road, but then diverted up Minerva Road. Later, buses towards Queens Park were diverted via Standard Road. The big trend of the 1990s was to split routes into shorter sections, and 187 met this fate in 1999. The original section from South Harrow became the 487, running as far as Harlesden, then on to Willesden Junction station. 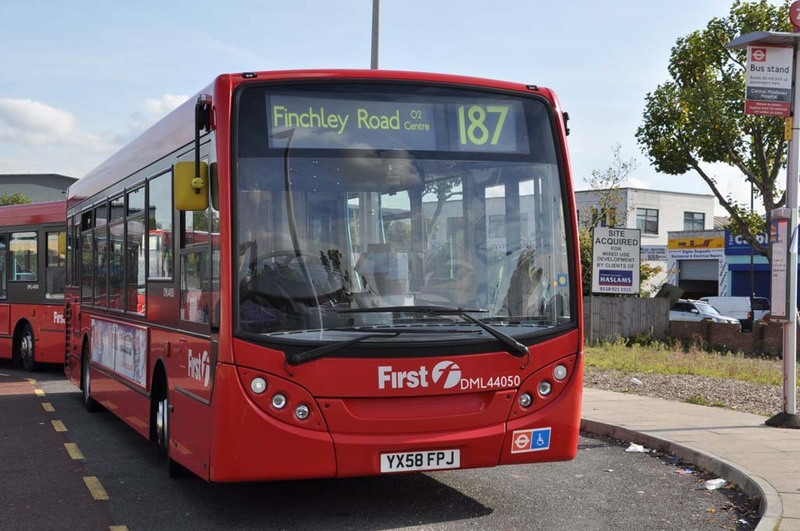 The 187 was revised to operate between Central Middlesex Hospital and Queens Park, via Park Royal Asda, Minerva Road/Standard Road and then the north end of Chase Road, then following the previous routeing. Both sections at long last regained a Sunday service – then 187 had lost its in 1970, while the 487 section had been busless on Sundays since 1967. Both routes were tendered and awarded to Metropolitan Omnibus, trading as London Traveller, which ordered unusual East Lancs bodied Volvo B6LEs. About a year later the Metropolitan Omnibus name was adopted as the fleet name. The residual 187 route was decidedly short, so opportunity was taken in the spring of 2000 to extend the route and replace part of lengthy route 46. Thus the 187 was extended over the 46 (almost over the route it followed until 1982) to Swiss Cottage, and then on to the Finchley Road shopping centre. This remains the routeing today. The B7LE fleet was augmented to cover the extension. As noted on the 487 page, following management difficulties at Metropolitan Omnibus, it was sold to Thorpes (which have in turn was sold to Metroline, from which the 187 and 487 were won in 1999!). However, Thorpes continued to have difficulties with the routes and surrendered them early. They were re-tendered by TfL and won by First Centrewest using DM class Marshall Capitals DMs, as mentioned above, initially models cascaded from the 28/31/328 which had just been converted to double deck, and offering substantially fewer seats than the B6LEs. These were supplemented by a few DMLs that were available. Operation has been from Willesden Junction from the outset.